Bangladesh: where writing and blogging puts your life in danger On February 21, 2016, The Hague Peace Projects and Mukto-Mona are organizing the “Bangladesh Alternative Book Fair” in Humanity House, The Hague. An event about the declining space for freedom of speech in Bangladesh. There will be a short documentary, book-presentations, public debate, discussions and exchange of views on the current political situation, the suffocation of the freedom of speech and the rise of extremism in the country. One year ago, on February 26, 2015 Avijit Roy, a US based Bangladeshi writer, blogger and founder of Mukto-Mona, was hacked to death by extremists. He was in Dhaka, the capital of Bangladesh to attend the Ekushey Book Fair, launching his latest book. 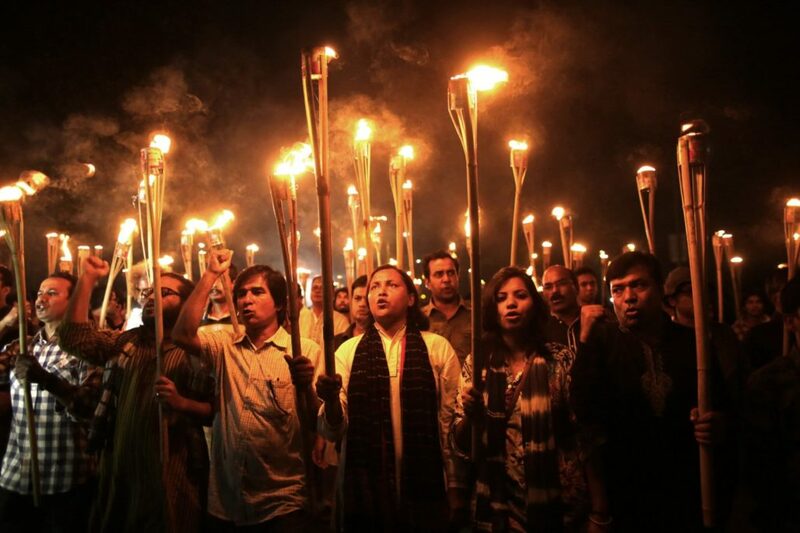 Bangladeshi writers and bloggers had already been operating in a hostile and insecure environment since the killing of blogger Ahmed Rajib Haider in February 2013. But within a timespan of only ten months also Washiqur Rahman Babu, Ananta Bijoy Dash, Niloy Chatterjee and Faisal Arefin Dipon were brutally murdered. They all were targeted by extremists for being critical to religion. Sketch made after the murder on Ananta Bijoy Dash, the third killing in 2015. Niloy Chatterjee was murdered in August and Faisal Arefin Dipon murdered in November 2015. The Ekushey Book Fair is THE most important yearly event for every Bangladeshi writer. It takes place in the month of February, in celebration of International Mother Language Day the 21st of February. Also this year, the Ekushey Book Fair is taking place. But with many writers and books being absent, it reflects the silencing of independent and critical voices in Bangladesh. Writers and bloggers who could, have left the country. Those who couldn’t, chose to be silent. In protest and solidarity with Bangladeshi writers facing persecution, the Hague Peace Projects and Mukto-Mona organize a ‘Bangladesh Alternative Book Fair’. On Sunday the 21st of February Bangladeshi writers and bloggers now forced to live abroad will come together in the Humanity House in The Hague, Netherlands. There will be books, writers and freedom of speech. People paying tribute to Avijit Roy.